Usually, egg shell thrown away after using it. We can use egg shell to enhance the beauty. We can also use its powder. Tone: Mix vinegar in grind shell of eggs. Applying this on face improves the tone. Glow: Mix aloe vera gel in its power and apply its on face. It increases glow of the skin. Pimples: Mix honey in shell powder and apply it on pimples. It removes pimple easily. Teeth: Apply egg shell powder on yellowing of teeth. It easily removes the teeth. Food: Keep egg shell near to the vegetables and fruits. It remains fresh for long time. Utensil: Clean the utensils with egg shell. Utensils will shine. Plant: Mess the egg shell and put it in plants. It increases growth of plants. It works as fertilizer. Worms: Keep egg shell in the home. Lizard and other worms won’t come in the home. Pet: Mix egg shell powder in pets’ diet. It has calcium and pets’ remain healthy. 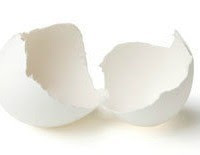 Wound: Apply egg shell on wound and cover it with strip. Wound fill easily.